Google Play Store UK now has 4K content for sale | What Hi-Fi? 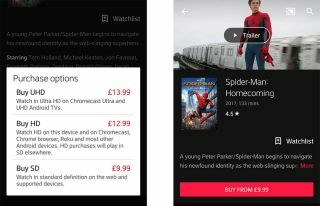 UK owners of a Google Chromecast Ultra or certain Android 4K TVs can now purchase and watch 4K movies from the store. 4K content on Google Play Store has been available in Canada and the US for some time - but now, almost a year later, it has finally hit the UK. Those with a Google Chromecast Ultra streaming stick connected to a 4K TV, or with a compatible Android TV (Google isn't saying which just yet), will be able to purchase 4K titles from the Google Play Store. A minimum 15Mps internet speed for playback in the higher resolution is also required. A search for ‘4K’ and ‘4K movies’ within the store doesn't bring us any closer to discovering available UHD titles either. As you might expect (and can see in the image above), a UHD version costs more than the HD equivalent – in this instance, £13.99 and £9.99 respectively. We're pleased it isn't a huge premium to pay – especially when you consider HD versions of even newer releases (Beauty and the Beast, for example) are also £13.99. Google isn't quite matching the genorosity of Apple - it has a wider catalogue at the moment, and is automatically upgrading previously bought films from its iTunes Store to 4K (and HDR) when they're available. But newly purchased films on both services look to be similarly priced. So what about HDR? Google’s support page offers information on HDR playback specifically for American and Canadian users, but it looks like the UK will have to wait a little longer.